Modern Pergola - Who Has The Best Modern Pergola? A high quality modern pergola takes the traditional garden structure and elevates it to a whole new level. 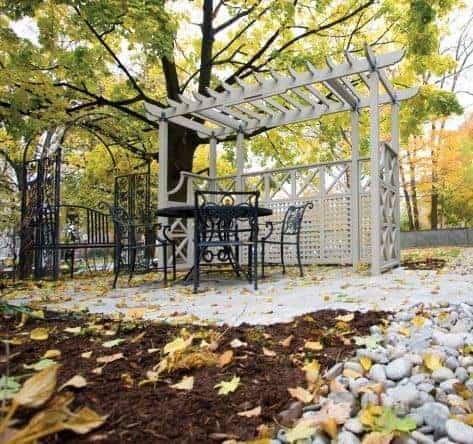 Pergolas have long been used as a place to grow or display climbing plants, or in the case of covered pergolas to provide shade, and many of them follow variations of the same traditional yet effective style. Modern pergolas can be a radical departure however, and their exciting designs and innovations add a touch of class to any garden, so we expect them to become more widely available and to appear in more and more gardens in the coming years. With an ever growing number to choose from, this WhatShed guide will help you find the modern pergola that’s ideally suited to you. There was a lot to consider when compiling our league table, with the cost and value for money being prime factors. We also considered the size and design of the modern pergolas, and their aesthetic appeal, as this is after all one of the things that most distinguishes them from traditional outdoor pergolas. We can now bring you the top modern pergola available to buy online in the UK today, and nine very high quality runners up. The modern pergola market is a growing one, and it’s likely that there will be more models, and more models to choose from, in coming years. We did find ten very high quality models for our league table, however, and so it’s well done to the extended dragon pergola that gains the honour of being our number one modern pergola that can be bought online in the UK today. Its value for money, size, long warranty period, and looks all impressed us, and helped it claim the top spot. 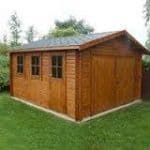 Whether you want a pergola or a log cabin, or a garden building of any size and shape, WhatShed will bring you in depth reviews that give you all the information you need. The first thing that captured our attention when we saw this truly modern pergola was its size. It has a base width of 2.70m and a base depth of 4.80m, making it the largest pergola to feature in our top ten league table. That means that there’s a lot of room for climbing plants, and it also makes a large and instantly noticeable garden feature that’s sure to bring compliments. For its size it also offers exceptional value for money, being available for significantly less than nine hundred pounds. This combination of size, which brings with it versatility, and affordability makes this an obvious choice to be the number one selection in our list of the best contemporary pergolas. What makes this stand out as a modern pergola is the bowed rafters, which create the appearance of an oriental temple or tea house. We found it very striking visually, and yet it’s also very practical as it creates an ideal environment for climbing plants to cling onto. Being pressure treated, of course, these timbers should also be very durable, as the 15 year warranty shows. What we were also very impressed with was the inclusion of strong spikes at the base of the six supporting legs, meaning that the pergola can easily be fixed into an area of soft ground. The joy of a modern pergola is that it takes what can often be a plain and simple garden structure and transforms it into something modern and exciting. This domed pergola is a perfect example of this, by eschewing the traditional four sided rectangular design that we often see in the traditional pergolas we review, and replacing it with six posts that lead upwards to curved rafters and a round finial. Hanging between the tops of each support there’s a stylish rope, which was a design touch that we thought worked really well. The effect, as the name suggests, is very much like a flower, which is appropriate as with so many timber struts its idea for usage as a growing frame. This is another modern pergola that’s slightly larger than the average as well, with a base area of 3.28 x 3.28m, and yet it comes at what we feel is a very reasonable price of £642.49. This particular model comes without a base, although a circular one can be added as an optional extra. Nevertheless it’s easy to install, and we can imagine it being used as a a place to sit and eat on a summer evening as you look out at the garden or up to the plants arranged across the timbers. With its striking looks and a good value price considering its size, this earns the number two spot in our league table. 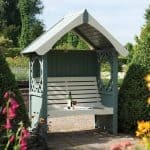 We’ve reviewed lots of pergolas from Grange, and they come in a range of styles and sizes, from the classical to the modern. This is a fine example of a Grange modern pergola, but even though its design is unique and strikingly original it’s also one of the most functional that we’ve seen and for that reason it earns a place in the top three of our WhatShed league table, even though it’s also the second most expensive model in our list. The cloche shaped design has four openings that are wide enough to walk through, situated between four pairs of curved timbers made of sustainably sourced and pressure treated softwood. With base dimensions of 3.45 x 3.45m, and a peak height of 2.85m, there’s lots of room in the centre so it’s an ideal place for a picnic or barbecue. That’s why this modern pergola scores highly on functionality for us, especially as there is still lots of timber to grow plants upon. 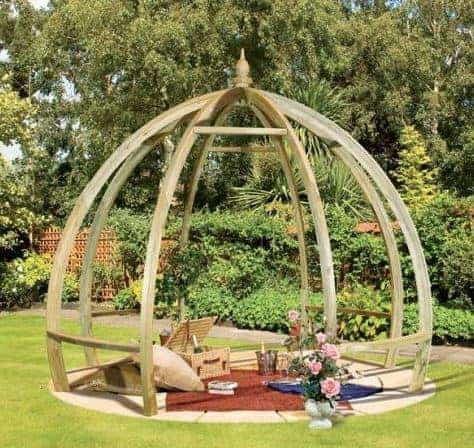 If you have a budget that stretches towards the eight hundred pound mark, and want a modern pergola that will act as a beautiful and durable focal point for your garden, this this is certainly one to add to your shortlist. This is the first patio style pergola in our top ten league table, and while it’s not the most ornate example of a modern pergola, nor the most generously sized, it is the least expensive, and its this exceptional value for money that carries it into the top half of our list. It has a base area of 2.70 x 2.40m, and just two supporting legs; the rear section will need to be attached directly to a house wall. 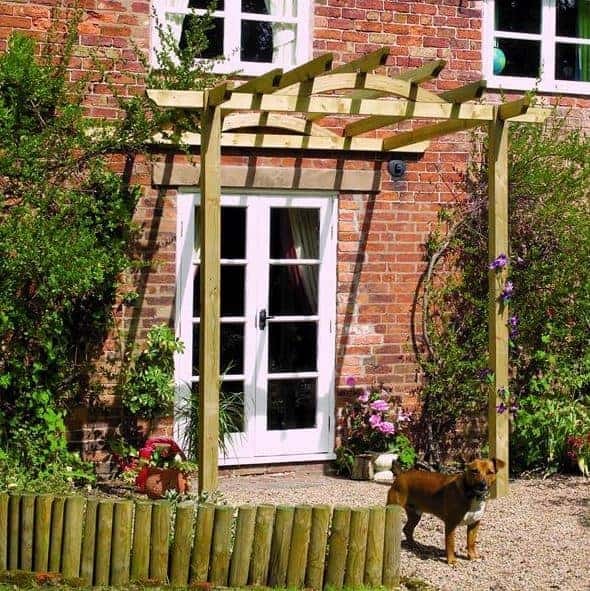 This cuts down on the building’s flexibility as it means that you can’t situate it wherever you want, but it also gives the pergola added strength and stability, which is why we feel it would be an ideal choice for people whose gardens are often exposed to strong winds. The house wall also provides added weather protection, and can create the shaded areas that many contemporary pergolas can lack. What elevates this modern pergola above traditional models, is that it has curved rather than flat struts on its rectangular roof. It’s a little touch, but one that we found made a big difference visually, and of course this can be enhanced still further with the addition of plants and flowers growing on it. We were also impressed by the inclusion of spikes, making it easy to ground the supporting legs. One of the things we like most about contemporary pergolas is that they can take many different forms, rather than being constricted to a traditional rectangle or octagon. This is demonstrated very aptly by this very original modern pergola that deconstructs the pergola and turns it into an extended walkway. There’s a nod to the traditional as well, with the inclusion of roping between sections, but the overall effect is something very modern and we were impressed by it at first sight. It consists of three arches with ropes between them, and yet when assembled it’s sure to catch the eye of neighbours and visitors. 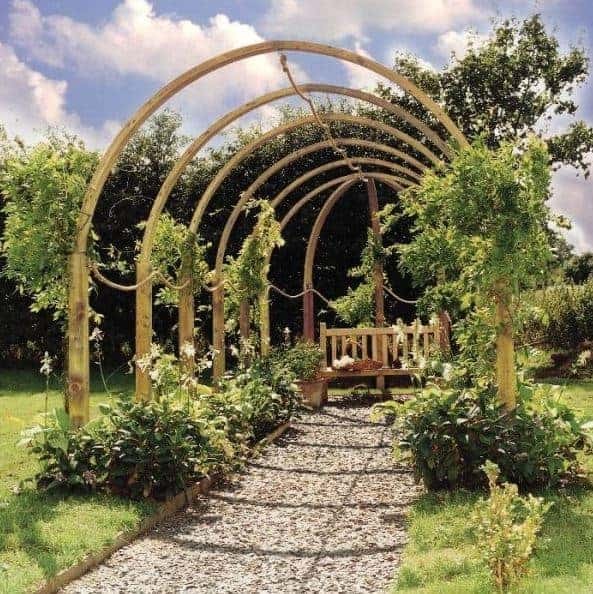 It also, like our runner up pergola, has a designer name attached: Jac Flower, who was a garden expert who often appeared on television shows and at major horticultural shows. What we liked most about the design is that it creates an ideal environment for climbing plants to thrive in. We also feel that the addition of a garden table and chairs at the end of the walkway would make this an excellent place to take guests before or after a dinner party, so that this can become an extra and much loved feature for your garden. For a pressure treated nine foot modern pergola that has a very different look we feel this represents good value for money. 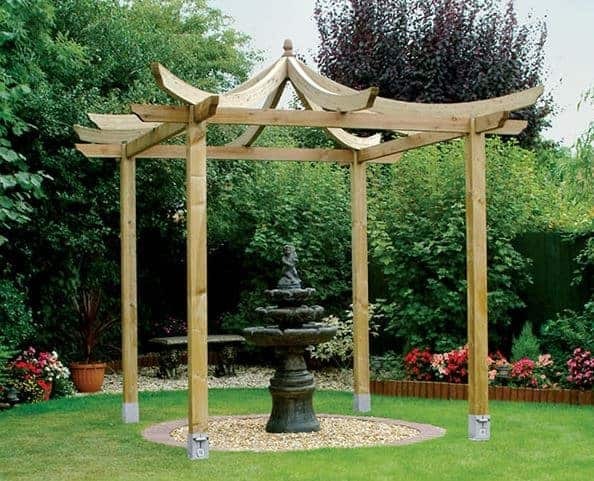 This pergola follows a similar Japanese style to the pergola taking our number one spot, but it’s significantly smaller with a square base size of 2.70 x 2.70m. 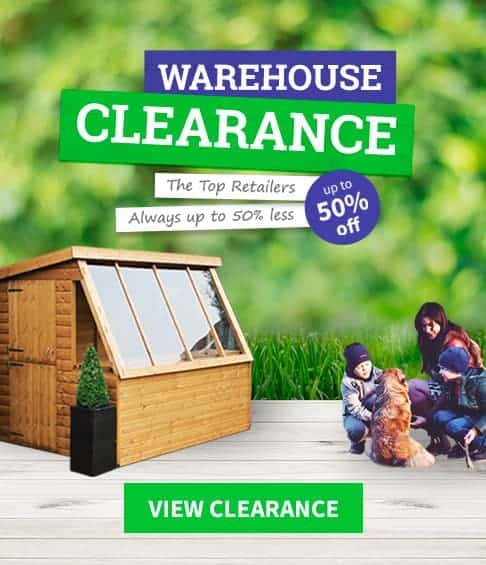 This in itself brings along its own advantages, however, as it means that it’s considerably cheaper, and it’s also more suited to those with smaller gardens and whose space is therefore at a premium. We were still highly impressed by the oriental look created by the rafters that rise 3.25m above the ground. Like all but one of the pergolas in this list we were also pleased to find that the timbers had been pressure treated, which means that they’re very low maintenance and come guarantee against rot for 15 years. We can imagine the Japanese style of this modern pergola fitting in particularly well near to a water feature or a fish pond. 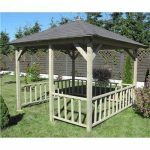 If you want a low cost and yet very good looking pergola to bring a touch of zen to your garden, then this comes highly recommended at a price of not much more than five hundred pounds. This modern pergola has a stunning look all of its very own, taking the Jac Flower walkway we looked at earlier to its logical conclusion. In effect it’s three concentric circles that are joined by narrow steel struts, with dimensions of 2.58 x 2.28m. It’s only when you get close to the structure that you realise that they are joined at all. 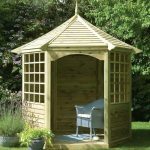 This is part garden building and part sculpture, and for a price of just over seven hundred pounds it can add a touch of class and sophistication to any garden. It was the striking appearance that first grabbed our attention, but on closer inspection of this contemporary pergola we were pleased to see that it wasn’t let down by the quality of its components. The wood used has a faint green tint, which is a sign of the pressure treatment that’s been applied and gives it excellent rot resistance as well as a 15 year guarantee. The steel struts have been galvanised to give them extra strength as well, and this also helps to allay any fears about rust developing. This then is a modern pergola that should remain just as eye catching for many years to come, and we feel that it should look particularly impressive when laden with plants and positioned around a pathway. 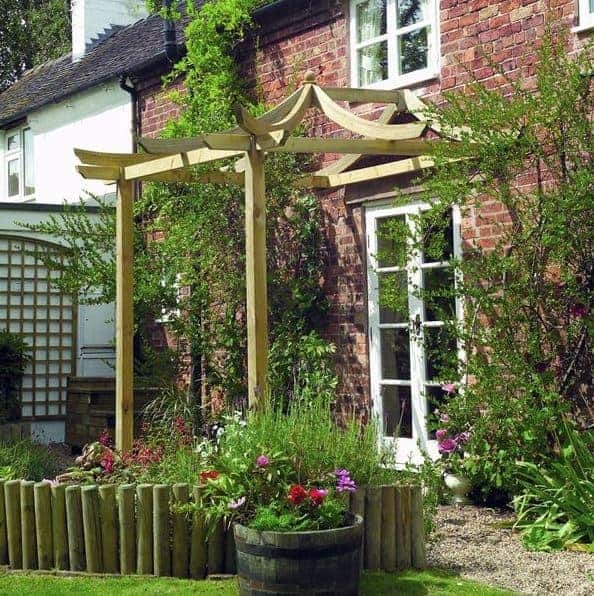 Whilst a modern pergola can be used as an attractive sculpture to grow climbing plants on in the garden, many people like the look of plants and flowers around the entrance to their homes. 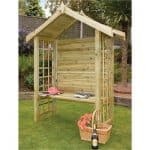 That’s where a patio pergola such as this one comes in very useful, and because it’s also one of the most attractive patio pergolas that we’ve seen it deserves its place in our WhatShed league table. It’s also strong and stable, and comes with the added peace of mind that’s given by its 25 year warranty against rot. Once again, this modern pergola takes its inspiration from the far east, and whilst we found this very pleasing on the eye even in its original tanalised state, this can look even better if it’s then painted or stained to protect it from the UV rays of the sun as well. 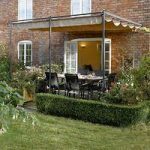 It does cost significantly more than the other patio pergola in our list, which accounts for its lower relative position, but it’s still very good value for money when compared to the freestanding pergolas we’ve reviewed. With ground spikes included as well to make it easy to install, this is a smart choice for those who are looking for a natural and cost effective way to brighten up the entranceway to their home. 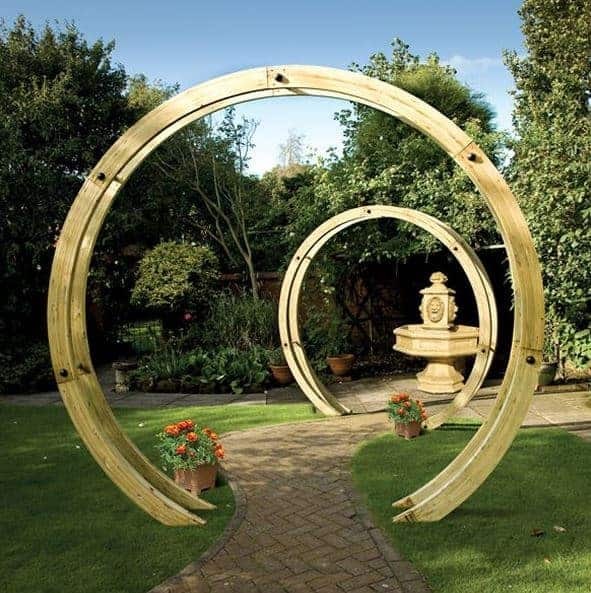 The very best contemporary pergolas are not afraid to strike out with a style of their very own, and nowhere is this better demonstrated than with this free standing flower circle. Whilst it would form a perfect complement to either of the walkways that have found a place in our list, we found that it looks just as impressive when positioned on its own, either across a pathway or as a feature in the centre of a garden environment. We appreciate, however, that the radical design of this modern pergola may not be to everyone’s taste, which is reflected in the position that we’ve given it in our league table. The pergola itself consists of two large concentric circles, each with a diameter of 2.28m or approximately seven and a half feet. These circles are joined together by a series of tough stainless steel rods creating a depth of 0.27m. 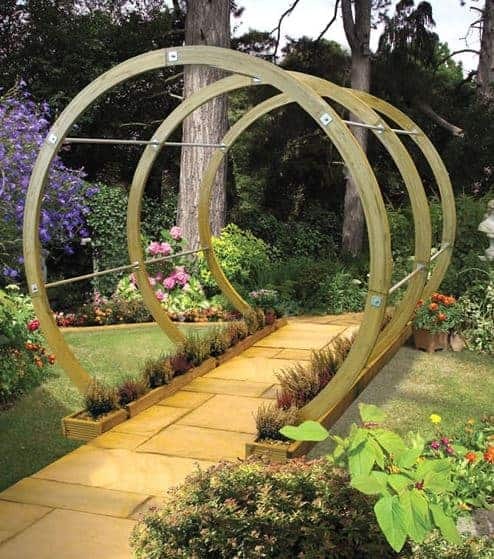 Even though these are far removed from the traditional rectangular outdoor pergolas that we often review, they can still be a perfect frame to grow plants upon and that will then create a visually striking result of the two timber circles filled with climbing plants. If you live in a contemporary household with minimalist styling, then this could be the ideal modern pergola for you, and of course they can be bought in pairs or sets for even greater effect. 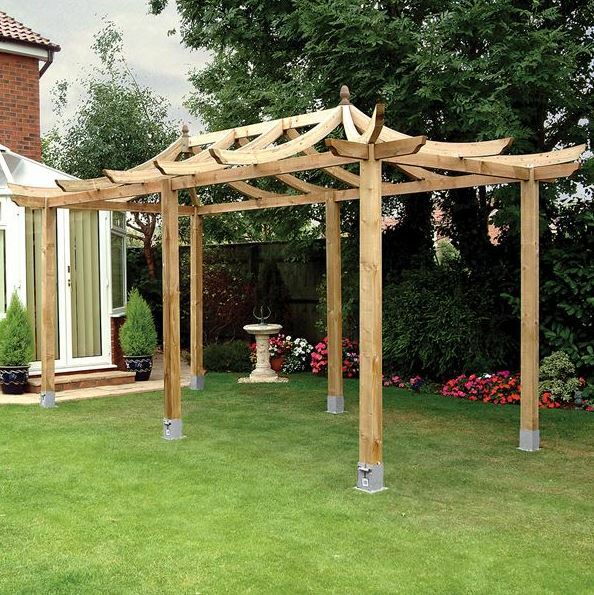 This takes a stylish and modern pergola and adds three sides to create a highly useful, and flexible, garden room. The result is a building that’s a cross between a pergola and a gazebo although the overhead roof at a height of 2.34m would make an excellent location to grow plants upon as would the trellis work, in two different patterns, that occupies the sides. This very contemporary take on a pergola adds extra functionality to the genre, although it does lack the exiciting design that we’ve seen on many of the structures in this league table. It also has to be noted that this costs more than any other modern pergola that we’ve looked at, although the added functionality that it offers adds to its overall value for money. We would have liked to have seen a pressure treatment applied, and the long warranty that we would have expected to accompany it, but we were pleased to find that cedar timber had been used as this is a wood that’s noted for its natural rot resistance. 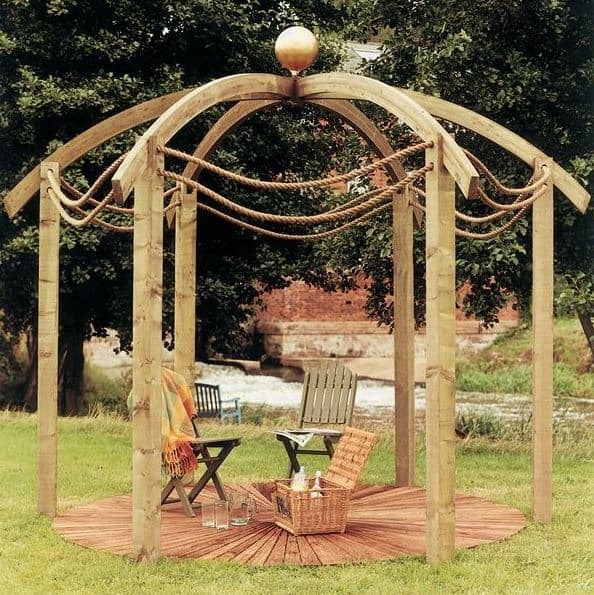 If you’re looking for a stylish pergola that can also be used to house garden seating, and can afford the more than thirteen hundred pound price tag, then this could be a garden building that ticks all the right boxes for you.